The Vikes finished third on the women's side (388 points) and fourth on the men's side (483 points). The UBC women won their 10th consecutive title running away, outscoring the second-place Calgary Dinos by 274 with 969 points over the three-day event. The men's race was closer, with the Thunderbirds scoring 800 points to defeat the second-place Dinos by 98.5. Alberta, Victoria, and Manitoba rounded out the top five team finishers in women's action, while Victoria, Alberta, and Regina followed UBC and Calgary in the men's team standings. "Ryan has done a great job looking at kids that the centres aren't looking at like athletes from smaller towns and communities that haven't necessarily been exposted yet and that's working quite well for us right now," highlighted Vikes head coach Peter Vizsolyi about his assistant coach Ryan Clouston's recruiting efforts. Vizsolyi referenced the strong performances from New Brunswick's Daniel Greer and Padric McKervill. "Taylor is a bit unique as far as her incredible community service contributions," added Vizsolyi about the fifth-year and her created business called Tay's Team, an initiative that supports ill children in hospitals. The Science major personally knits and crochets fun character hats for the children and is known for iconic superhero, Disney princesses and Pixar characters. Vike Danielle Hanus earned three gold medals and one silver, while she led the Vikes in all three medals won in the relays including a silver in the 4x100-m medley and 4x200-m freestyle and a bronze in the 4x100-m freestyle relay. "You could overlook Danielle," said Vizsolyi about the third-year VIke who was the first non-UBC female swimmer to top the podium. "She is just really, really steady. She doesn't just get up and win a rae she goes unrested and every time shaves times and then goes and does the exact same thing in the relay. She is just really, really good for the team because she is such a solid person to be around." On the men's side Eric Hedlin topped the podium in the 1500-m and 400-m freestyle, while Josh Zakala had the only silver in the 200-m individual medley. The Vikes men also had four bronze medals including Espesen's 200-m breaststroke swim and Zakala's 400-m individual medley performance. 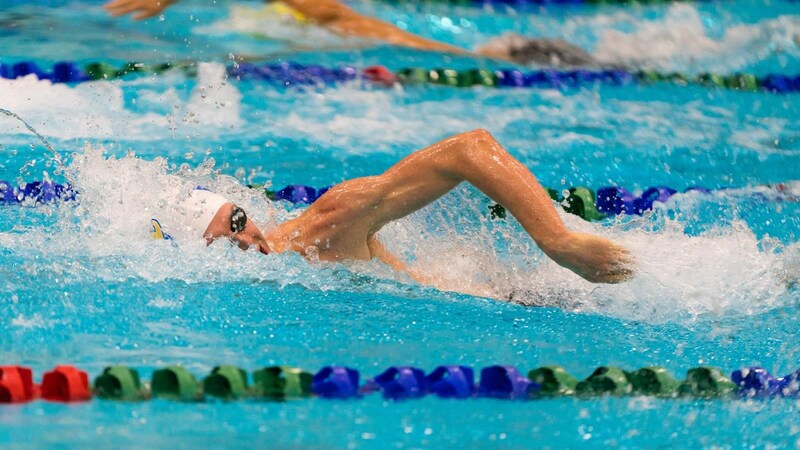 The Vikes also had the bronze in the men's 4x200-m freestyle and 4x100-m medley relays. On Day 3, in the men's 200-m butterfly, Ethan Jensen qualified for the A Final and finished eighth overall in 2:05.24. Riley Wilkins and Padric McKervill finished in the middle of the B Final to take 13th and 14th place, respectively. A pair of Vikes qualified for the A Final of the women's 200-m breaststroke including Andrea Farmer and Jamie Hellard, while Kara Wilson was 11th overall and second in the B Final. On the men's side Espersen finished with a bronze in 2:17.26, while the Vikes had four in the B Final including Daniel Greer who finished ninth overall in 2:21.03. Arthur Firmino, Zachary Dumas and Thomas Van Maren were 10th, 11th and 13th, respectively. Fourth-year Vike Hedlin and Calgary's Peter Brothers went stroke-for-stroke down the stretch in the men's 400-metre freestyle, with Hedlin taking gold by just six hundredths. Ethan Phillips, who also qualified for the A Final, finished fifth in 4:00.03. In the women's 400-m free fifth year Kaitlin Gervais was fifth in 4:23.14, while in the B Final Snowden-Richardson was 10th (4:31.72), Lauren Taylor was 11th (4:33.32) and Alice Gentleman and Anna Letkeman were 14th and 16th, respectively. The Vikes earned their third-straight relay medal, this time in the 4x100-m medley relay as Hanus, Jamie Hellard, Ballantyne and Gervais took silver in 4:12.65. The Vikes qualified for nationals behind gold medallists UBC (4:04.68). The Vikes men also got on the podium in the same relay, the 4x100-m medley, as Zakala, Espersen, Jensen and Mallender finished with a bronze in 3:42.91 to qualify for U SPORTS Nationals. Calgary took gold, followed by UBC. "Both of the relays tonight were UVic records and the fact that all weekend we were on the podium or just shy of the podium in the relay events shows that we are progressing as a team," added Vizsolyi.